Christine Datian has come to my rescue! Little did she know, but I’ve been swamped this week helping with an upcoming event at our church. In fact, I’ve been taking reservations along with my side-kick, Linda Aginian, and it’s been keeping us on our toes. How did Chris rescue me? By providing me with her latest recipe, Lemon Yogurt Hummus currently appearing in The Armenian Mirror-Spectator(pg. 15), to post for my readers. The recipe is quick, simple, and lip-smacking delicious! I'll be back in 'The Kitchen' soon! Place the ingredients, remaining liquid, and spices in a blender, cover, and process until smooth. Refrigerate until ready to serve. 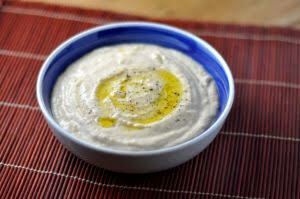 Place hummus on a platter or in a bowl and serve with sliced vegetables, cracker bread, pita bread, and pita chips. Garnish with choice of fresh lemon wedges, olive oil, parsley, chopped tomatoes, paprika and mint. Note: *This hummus recipe may easily be doubled for more servings.